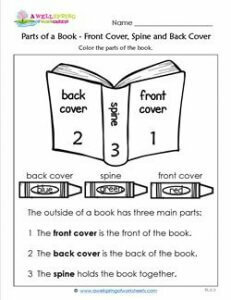 There are three main outside parts of a book – the front cover, the back cover, and the spine. This worksheet illustrates those three parts very well. Kids pick up books and look at them all the time but don’t know there are names for each part of the book. After modeling and teaching the kids these book parts, an adult can read the page and demonstrate what color kids should color the parts.